Does Stress Affect Your Thyroid? There are many factors that affect your thyroid with stress being one of the common causes. Could stress be affecting your thyroid? Chronic stress leads initially to overproduction of the hormone cortisol, and eventually to adrenal fatigue. 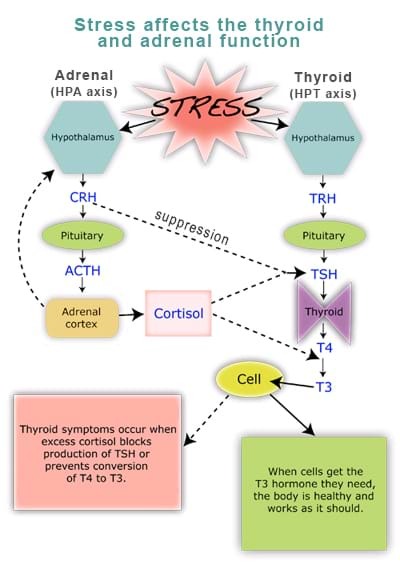 Cortisol, as well as corticotropin-releasing hormone (CRH) from the hypothalamus, can inhibit thyroid-stimulating hormone (TSH) in the pituitary gland. Having either too little or too much cortisol can also inhibit conversion of the thyroid hormone T4 into T3. Low T3 leads to hypothyroid symptoms. Simple nutrient and lifestyle modifications can support thyroid function and lower the impact of stress on your overall health and well-being. Some years ago functional medicine practitioners began to notice a pattern: thyroid dysfunction was really common in stressed-out patients. So they started paying more attention to this connection and the more they learned, the more they realized how tightly linked the physiological relationship is between a woman’s thyroid function and her response to stress. We all know that too much stress isn’t good for our health, but we don’t always make the connection between stress and thyroid problems � or know how to change our lives to reduce our stressors. Continuous stress leads to high levels of stress hormones, which then can have a negative impact on thyroid function, especially if those levels stay high over the long-term. What’s exciting to note is that we have many natural ways to stop this cycle � without drugs. Over the years, very effective tools have been developed to help women support their thyroid glands simply by reducing stress. Whether you’re experiencing symptoms or not, it can help to take a closer look at the impact that the adrenal and thyroid glands have on each other. Then you can lighten the stress load on your already busy thyroid and prevent thyroid imbalances. Hormones are molecules released by one part of the body to carry messages to another area in the body. The thyroid’s main job is to produce just the right amount of thyroid hormone to tell your cells how fast they should burn energy and produce proteins. The adrenal glands’ primary job is to produce just the right amount of stress hormones to help you to respond to all kinds and degrees of stressors. Think of the thyroid and adrenal glands as guardians, or protective intermediaries of the endocrine (hormone-producing) system. They both function as complex sensors, continually responding to ever-changing conditions within the body, and relay information back and forth between the brain and the body. Because both of these endocrine loops trace back to the pituitary and hypothalamus in the brain, and the hormones produced along these two axes interact, chances of dysregulation are higher along one axis when the other loop is overactive or underactive. The signaling for release of both sets of hormones originates in an area of the brain known as the hypothalamus, which sends hormonal messages to the tiny gland in the brain called the pituitary. From here, hormonal messages are relayed to both the thyroid and the adrenal glands. The adrenals and thyroid, in turn, produce hormones and provide feedback to the brain that says �that�s enough for now!� We call these negative-feedback loops the HPA axis (hypothalamic-pituitary-adrenal axis) and the HPT axis (hypothalamic-pituitary-thyroid axis). A big adrenal response to a highly stressful event is normal. But afterwards, the adrenals need to rest. You need just the right amount of cortisol for your thyroid to function optimally. Too much (from acute stress) or too little (as a result of continuous stress over time) can lead to problems. Imbalances along each axis can result in either overactive or underactive adrenal glands, as well as an underactive thyroid. With constant stress, thyroid hormone production is reduced, those sensitive feedback loops between the brain and the thyroid are disrupted, and T3 receptors (which facilitate T3 action) can become less responsive. As you can see from the diagram, the hormones from each loop interact, and cortisol and thyroid hormone work in concert. This may be one reason that symptoms of thyroid dysfunction can show up even when your thyroid lab tests appear �within normal limits.� Here�s how this happens. Much of the medical literature looking at the effects of stress on the thyroid has focused on hyperthyroidism and a condition called Graves’ disease. In general, Graves’ is caused by an autoimmune response that prompts the thyroid to make too much thyroid hormone. This is known to occur after a sudden stressful life change in people with a specific genetic makeup. But much less talked about is how too much stress can also cause a slowing of the thyroid, called hypothyroidism. This inhibition of your thyroid and hormone receptors often takes place quietly behind the scenes for months or years without causing overt symptoms. And this is why so many women are caught off-guard when they are diagnosed with a thyroid disorder. They think everything has been going fine and all of the sudden, they feel horrible. The fact is, if you’ve been experiencing chronic stress over time, the resulting adrenal imbalance, whether overactive or eventually underactive, has also been inhibiting your thyroid function. Some patients can even remain in what we call subclinical hypothyroidism, where their thyroid hormone levels are still within the standard normal ranges, even while they’re experiencing symptoms of low thyroid. Thankfully, there are many ways to reset your stress response and reestablish communication along your brain-adrenal�thyroid pathways. Supply the raw materials. Fortunately, there are many opportunities to promote healthy thyroid hormone production with nutrients. Selenium, iodine, and vitamins A, B, C, and E are all necessary players in the production of thyroid hormones. So a high-quality multivitamin�mineral complex like the one we offer in our approach is essential for thyroid support. Sleep. If you want to have healthy hormonal balance, set a reasonable bedtime � and stick with it. The ideal time to sleep is between the hours of 10 PM and 6 AM. Allow yourself adequate time to unwind before bed. � Setting aside quiet periods during the day makes it a lot easier to wind down and relax at bedtime . The downtime will give your adrenals a needed rest, and reset your neuroendocrine system so it can respond appropriately to whatever challenges are around the corner. Counter your daily stress. There are many ways � some requiring more of a commitment than others � to help your body relax. From deep-breathing sessions to scheduling a massage or spa day, you always have options. Some women are devotees of yoga, qi gong, or other meditative practices, while others prefer prayer or taking peaceful walks in the morning or evening. Exercise is essential for health, but exercising to the point of exhaustion can put your adrenal glands back into stress mode and elevate cortisol levels. So, by all means exercise, but take it easy. We can’t � and shouldn�t � just eliminate stress from our lives. But what we can do is support our bodies during stressful times, trying to lighten our stress load, and giving our adrenal glands regular rest periods. If you have a family history of thyroid dysfunction or if you’ve been told by a practitioner that you have a subclinical thyroid condition, take comfort in the fact that you can support your thyroid naturally. Remember that even small changes, especially if you stick to them, can add up to a dramatic difference!